A beautifully decorated semi-detached cottage near Chulmleigh in Devon that can sleep four people in two bedrooms. 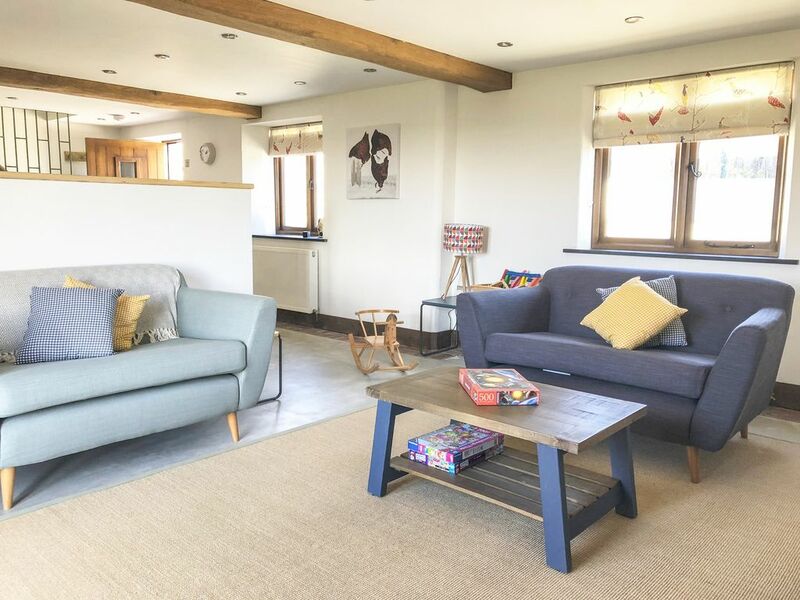 Houdini is a stylish barn conversion near the town of Chulmleigh in Devon. It has two bedrooms comprising of a king-size bed and a twin room, it also has a family bathroom and can sleep four people. Also inside is an open plan living area with a kitchen, dining area and sitting area. To the outside is off road parking and a shared courtyard with picnic benches. Houdini is a high quality cottage in a fantastic location. Amenities: Oil central heating. Ceramic hob, electric oven, microwave, fridge/freezer, washer/dryer, dishwasher, Smart TV, TV with Freeview, WIFI, selection of books, games. Fuel and power inc. in rent. Bed linen and towels inc. in rent. Travel cot, highchair and stair gate available on request. Private enclosed side patio with furniture and shared courtyard with furniture. Two small dogs accepted. No Smoking. Shop and pub 2 miles. Note: No linen provided for the travel cot. Town: Chulmleigh is a village in Devon. The narrow lanes, thatched buildings, courtyards and inns make it a pleasure to wander around. It is a year-round destination, with summer gardens and winter walks. The Tarka Trail begins at nearby Eggesford Forest, which is on the banks of the River Taw, it follows a pretty route through woodland. Chulmleigh is good for birdwatching, you will spot all sotys along the riverbanks. Fishing is also popular in the area, with salmon and sea trout in the rivers and coarse fishing on Catham Lakes and Huntacott Water. Chulmleigh is midway between the national parks of Dartmoor and Exmoor and within easy reach of the rugged north Devon coast. Oil central heating. Ceramic hob, electric oven, microwave, fridge/freezer, washer/dryer, dishwasher, Smart TV, TV with Freeview, WIFI, selection of books, games. Fuel and power inc. in rent. Bed linen and towels inc. in rent. Travel cot, highchair and stair gate available on request. Private enclosed side patio with furniture and shared courtyard with furniture. Two small dogs accepted. No Smoking. Shop and pub 2 miles. Note: No linen provided for the travel cot.